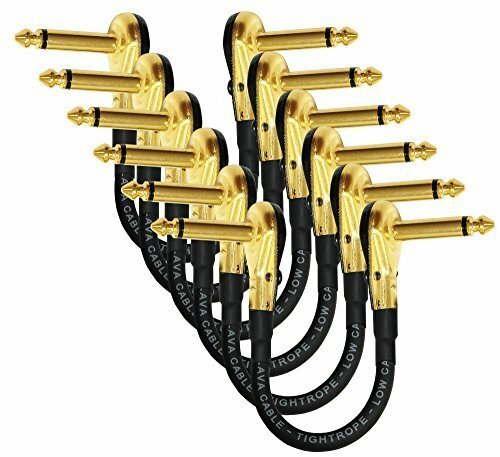 Custom Made - 6 Units - 6 Inch Lava Cable - Lava Tightrope (Black) - Low Capacitance Patch Cable (Made in USA) with Premium Gold Plated ¼ Inch (6.35mm) Low-Profile, Right Angled Pancake type TS Connectors IMPORTANT, PLEASE NOTE: The cable length is measured from tip to tip of each connector, this is the industry standard for measuring patch cables (the measurement details are clearly depicted in one of the images in the image gallery to further clarify the measurement process. There are many images in the gallery, please click on the main image to open the full gallery). Please also check out the connector dimensions as some connectors might be too wide for jacks that are spaced close together. These low-profile patch cables are made with the innovative TIGHTROPE - Low Capacitance Patch Cable by LAVA CABLE - USA, designed to save your valuable pedal board real estate, these patch cables will enable you to get the most out of your system whilst giving you the freedom to minimize the distance between pedals. TIGHTROPE 20 AWG, low capacitance (32 pF/ft) solid-core patch cable is the perfect choice for musicians who want the best of both worlds: low price and a superior product. The TIGHTROPE cable is made in USA. Heavy duty construction using the lowest profile pancake design in the market. High-End 24k Gold plating to ensure increased conductivity and tarnish resistance. Custom Boot included to protect the cable from damage due to handling stresses (no other cable construction of this type comes with a boot). This low-profile patch cable will save much needed space on your pedal board. The Black-Gold connector design will also visually compliment your gear and will look extremely sleek in your rig. This sale is for a 6 patch cable (6 units), which is 6 Inch long. Cable length is measured from TIP to TIP as depicted in the images in this listing (please refer to the image gallery).